If you are an active trader or investor you should pay attention to realtime stock charts during every trading session. I trade actively, so I have to check live charts every day. I have my trading computer in my office and I also have a computer at home. I can stay home and do the same work as I can do in my office. I can check realtime stock charts in both places. Also, when I am traveling – and I must travel from time to time, due to business reasons or with my family – I use my notebook. This is a very powerful notebook which can work as a mobile workstation. I use the same programs on all my computers I use – in my office, in my home office and on my notebook too. It allows me to check situations realtime. I can check it the same way regardless of where I am. I trade actively every day and week so I spend a lot of time in front of my every-day trading computer. I especially monitor US exchanges from open to close. But I have noticed during my stock market career that it is not so hard and it is not so important to monitor the stock market all the day. But there are times when every trader should monitor realtime quotes of his/her open trades or picks that he/she wants to trade in his/her market strategy. Here I would like to describe what realtime charts I monitor and also what I think are the most important parts of trading hours for monitoring of realtime market quotes. The first two realtime charts I regularly monitor during my every day routine are the live charts of the major US market indexes – S&P500 and Nasdaq100. As I prefer to see premarket action before the exchange opens I use ETF shares tracking these major indexes. I have both charts in the same place to better understand which part of the market is stronger and which is weaker. This also helps me to monitor how market indexes act during a day. Are they weak generally or is the situation bullish? This observation helps me with the management of my open trades and with better management of my entries and exits. There are historical charts, there are daily, weekly and monthly technical stock charts and intraday live realtime charts. I have all these charts linked into one group. This means that when I change the symbol in one chart all price charts of the same group change to the same symbol too. Then I move though my list of open trades in my portfolio and check the situation on its live charts. I do this procedure two or three times during the day. I also check individual tickers when I see an alert that the price of my pick is moving and I have to do some trade management for this individual position. As I mentioned, I do my main technical chart analysis when US exchanges are closed. 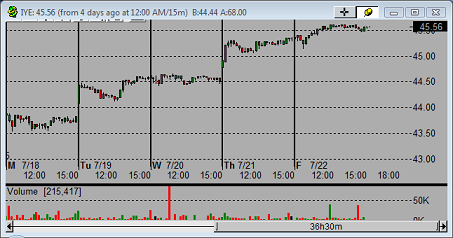 I prefer to check static historical charts – not realtime when moving during intraday action. I have a list of my trade setups and ETF picks that I have placed in one of my watchlist windows on my trade management software I use intraday. Then I use the same linked group of realtime stock charts. when I set for an alert that tells me that the price is moving close to my entry point. Then I monitor it closely and set up my entry order. I also check the whole list in realtime two times during a day, the second time it is in last trading hour just before close. The monitoring of realtime market quotes is an important task that every equity trader should do. If you are a day trader then it is critical for intra-day trading strategies. But real-time quotes are also important if you are a swing trader or position trader, and active investors should also have knowledge of how to monitor real-time stock market quotes. I personally feel that there are two periods when it is important to monitor the stock market in real time. The first one is the opening time. It is good to see how the market opens and what it does during the first hour or two. I do not place my stop loss order before the exchange is opened. And then the second important time period is market close. It is important to monitor the behavior of major market indexes and also realtime charts as I mentioned above. And act accordingly with trade management actions for open positions or when opening new trades based on your strategy and list of the best stocks and ETF picks that every trader or active self-directed investor has prepared.